Smart, one-touch 4K video-conferencing with anyone, anywhere. Netpremacy can now provide the brand new Hangouts Meet Hardware Kit, and there are several new upgrades to get stuck into. Chrome for Meetings has now been updated to a smarter, easier to use hardware kit that can solve any outdated conferencing issues you may have had. 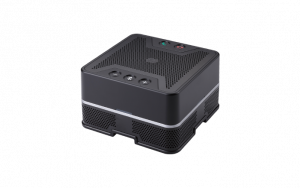 The package includes the new compact Chromebox 2 computer, powered by an Intel Core ™ i7 processor, and a 4K UHD camera that has a wide 120° field of view technology, this technology means that the images stay focused on the meeting participants. One of the most visible changes to the new device is that it now has a touchscreen control panel, allowing for one-touch meeting management. This is a big step up from the previous remote, which was significantly smaller and had a QWERTY keyboard on the back of the device. 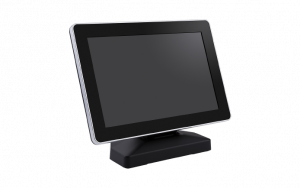 The new touchscreen has a larger surface area than the previous remote, making it easier and simpler to use. The speaker/mic has also been greatly improved. It now employs echo-cancellation and noise-suppression technologies which enables the delivery of crystal-clear audio. It is now possible to daisy-chain up to five speaker/mics to make sure that everyone in a larger room can hear, and can be heard. It helps to improve team efficiency through real-time collaboration, which ultimately makes it an excellent choice for the modern workplace. 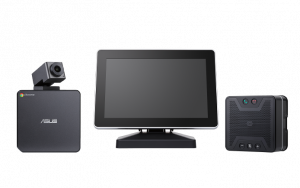 The newly upgraded Hangouts Meet Hardware kit has been specifically designed for enterprise. 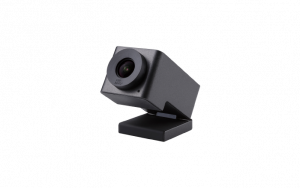 Its hassle-free and user-friendly, as it takes just one click to join a video conference. The new touchscreen panel enables you to easily schedule or join a meeting directly from Google Calendar. As a result, multi-person video calls are easy. Overall, the new hardware means that joining video calls, and using the interface has become easier and more intuitive, saving time and enabling for further productivity in the workplace. If you are interested in finding out more about the new Hangouts Meet Hardware, you can visit our website, or alternatively contact us.